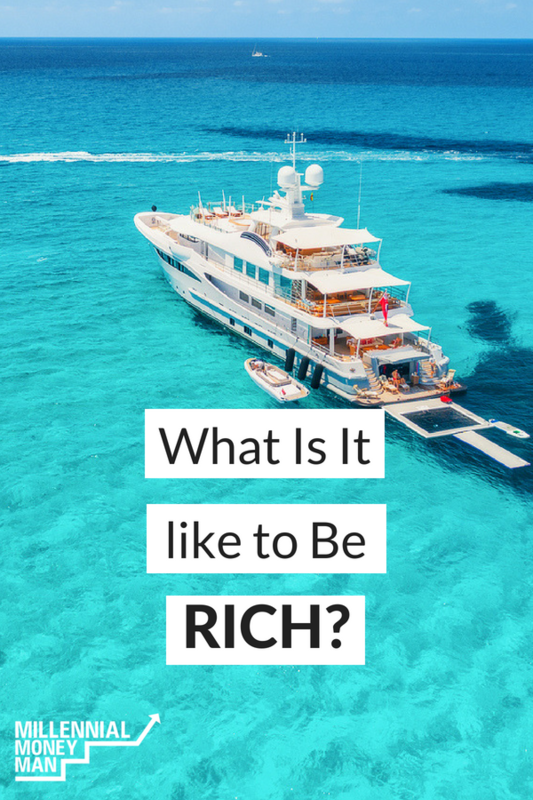 Have you ever wondered what it is like to be rich? Being a super rich multi-millionaire…just imagine what your life would be like. I do it all the time. What would I buy, what would my house and cars look like, how big would my boat be and what about my quality of life? Well, I'm in a semi-rare situation where I actually know a few multi-millionaires and wealthy people personally. So, I'm starting a new series on this site where I sit down with them and ask questions that I've always wondered about. As I did the interview, I was honestly shocked that I had never asked these questions before. It's very eye-opening. Try to read this interview as objectively as you can. Take the emotional reaction of “wouldn't that be nice” out of your brain. Really digest what these people say about money without jealousy (if possible). If you can do that, I think you'll love this as much as I did! Let's get this one out of the way – do you feel any different being a multi-millionaire? Mike: Not really. It feels about the same. After I hit my first one it felt different, but the ones after that weren't much different. But, the thought does stick in the back of your mind when you are dealing with stupid people. Me: Haha expand on stupid people, please. Mike: People that treat me like they are better than me, but have no idea what I've accomplished in life. When people are rude to me in everyday situations, I start thinking about how I could pay their mortgage or write a check for their student loans. Obviously, you can't say that kind of stuff out loud though. You also tend to think in much larger increments of dollars. For example – $200 doesn't mean as much to me anymore; you tend to start thinking in thousands or 10's of thousands of dollars. I guess it's really the same as what everyone else thinks about, but there are more zeros to account for. How much money do you think it would take to make you happy? Mike: $50 million. If I had $50 million dollars I could do anything I wanted, any time I wanted. Right now what I'm trying to do is not outlive what I've already saved. Mike: What would I do? I'd definitely buy a lake house with a new boat. To be really honest with you I'd probably do what my neighbor does. He has multiple houses where he follows the seasons. A house in Hawaii, Minnesota, and a house here. He just travels around to his three different houses and follows the weather. Kind of like that movie “The Endless Summer”. Or, I'd just give it all away. With your current lifestyle, would you actually outlive your money? Mike: No, I'll leave my wife a wealthy woman. She'll probably remarry and some other guy will be rich. I look around at some of my peers, and I wonder how my friends and family are going to live with any dignity as they get too old to work. It's something that I worry about for my friends. Truth be told, money gives you freedom. Freedom to choose, do what you want to do, live with dignity at the end of your life. It gives you more options. Can money make you happier? Mike: I would have to say yes, and the reason is that it gives the security of not having to worry about your future. I don't wake up every day stressing about money, whereas a lot of people do. It makes them do things that they normally wouldn't do or don't want to do. With money, you don't have to do those things. Therefore, I think I'm happier. How has your life changed since you made your first million? Mike: It really hasn't. You know, your life doesn't change, but your attitude changes. You strive all your life to make a million dollars, but then once you do… the second, third, fourth all become much easier to attain. Now it's not just you working anymore, but your money is working for you too and it becomes exponential. It does make you feel like you've done something right. Do you think about your money daily? Mike: Of course. I look at it hourly in the stock market. Mike: Stocks. Right now I like energy stocks because they are depressed. I like stocks that are undervalued. I like growth potential stocks. I also like trying to figure out what millennials are using and buying, and watch those stocks. I'd say you shouldn't necessarily follow the generation right behind you, but the one two generations behind you. The one right behind you isn't necessarily going to propel the country into the future, but it's the generation after that one that will in my opinion. Did you think you would be a millionaire when you were in your 20's? Mike: Yes. I always knew it. Mike: Just all the hard work and that I started saving young. It was literally drilled into my head by my father. My mother also taught me how to be very frugal with my spending. How long would you say it took to become a millionaire after your first job? Mike: Well, I was a dishwasher when I was 13. There weren't child-labor laws back then I don't think. I became a millionaire around 40 years old, so it took about 27 years. What's the best thing about having money? Mike: Not having to worry about money. Being able to work hard, pay your bills and not have to live paycheck to paycheck. You don't have to worry when the car breaks down or put anything on credit cards. Just the security. We also get to give back to charity, and my wife doesn't work anymore so she can go out and do good things in the community. What's the worst thing about having money? Mike: Trying to remember where it all is. You know you get multiple accounts and then you forget about them and find money you didn't know you had. Me: It's not stressful at all? Mike: Ha, no. If anything it relieves stress in my opinion. What do you see millennials wasting the most money on? Mike: I don't know. I think they're so whacked sometimes. Probably cars. Trading out cars too quickly. Buying things that they can't truly afford. But you know, they do it with houses too! Mike: A 2003 Yukon Denali with about 140,000 miles on it. My work truck is a 2000 Chevy Pickup with a little over 200,000 miles. What is your best financial advice for the de$troyers? Mike: Start early. If you want to be a millionaire, you HAVE to start early. That is the number one thing. But…with that being said. It's also never too late to start. If you don't ever get started, you can't finish right? I thought it was funny how Mike occasionally forgets about some of his accounts and he finds the money later! While I don’t ever expect this to happen to me since I keep a very close eye on all my accounts, I know it happened to my Dad once. In fact, when I was still in high school, I was trying to log into my bank account online and had trouble. I had to reset the password and do different things, then the account that finally opened up wasn’t in my name, it was my Dad’s. He was pretty happy when I told him that, he found about $15K. I like this interview series, very interesting. Thanks for the post, and thanks to Mike as well. Haha that was my favorite part too! I know it seems a little weird to lose track of an account like that, but over time I guess you just build up so many different ones that you find one you forgot about? It’s not that I forget about my accounts. I just don’t track all of them on a daily basis as I do with my stock accounts. For example: I have some very old IRA accounts that are invested in mutual funds that were meant to be very long term investments. So I only look at the statements from time to time. I like to say they are on “auto-pilot” instead. Interesting interview! How old is Mike now and how has he earned his millions? He’s either 59 or 60. He started his own company in his 20’s and then ran it for 30+ years. When the markets started to tank in 2008 he sold it and invested a large chunk of the profits (while the market was still trending down!). Obviously that calculated risk paid off! So in just one of his accounts his $200K (in 2008) reached $1.4M in 2016 – so that’s 600% return? Can you do a follow up on his investment strategy?! Perhaps a lot of that was contributions? I look forward to other interviews. Thanks for posting such quality content! In a world full of fight video reposts, it’s refreshing to see someone putting in the time and effort to keep a generation well informed on money matters. If you caught the market at the time when the media was calling it “doomsday” then you were able to purchase stocks at a very sizable discount! Most informed investors know the markets for two types of climates that i’d call Gain’s and Discounts…..All about calculated risk and being well informed. Self education is sooooooo important. I like this series! I wondered what type of business he originally built? I feel like now I should just drop some money on some energy stocks! Yeah this is pretty cool right? I’m thinking of trying to do one once per month, but I’m going to run out of millionaires pretty quickly haha! He built a swimming pool company from scratch. If you’ve ever seen the book “Millionaire Next Door”, that’s basically him. As always with stocks, just make sure you do plenty of research on quality companies before you do anything! I really should look into stocks… these mutual funds and indexed funds aren’t working well. I suggest not picking your own individual stocks. Do you really think that you can pick mostly winners and continue to manage them? Stay with ETFs that track large, mid-cap, and small indexes. Maybe put 10-15% into low volatility ETFs. And be patient. Checking your balance every day is not healthy. ??? Indexed funds should have done *very* well for you the last several years. Dun know what happened there! When I was a girl there was a comedian named Minnie Pearl that would say “Ive been rich, and I’ve been poor, and being rich is much more fun!”. I grew up poor, but in a home filled with love, and my mom and dad taught me about culture and the finer things in life. I wanted to have money when I grew up, but didn’t know how to go about it. I tried lots of things, but no go. Then when I remarried at age 42 we started a business. It was lots of hard work, but within 5 years we were making one million a year. Life was GREAT!!!!! We had $1000 a week to save and $1000 a week to spend. What fun we had! Then the economy tanked in 2010 and left us in a horrible tight financial situation like many others. I noticed in your comments above Mike was smart when things got bad. My rose colored glasses kept me from preparing better. With that said, I’ve been rich and I’ve been poor, and let me tell you…RICH IS MORE FUN! It is exactly like Mike said…..we don’t change, it is others’ attitudes that change. When we first bought our boat, then our home, then our nice cars I was almost ashamed to have it! Like I had to make excuses for what we had. Then I realized that we are all blessed in different ways, and like a nice pair of jeans, it all eventually fits and you feel comfortable. If other people seemed to act differently toward us, it was their problem, not mine. Another thing is what Mike said about needing to have money when you retire…..YES! My aunt and uncle lived a comfortable life, but did not save or invest for retirement, and thus ended up poor in their late 70s, right when you need money for medical bills and help to do daily living. My parents on the other hand, never had money. My mother invested and worked the stock market starting at age 50 and now they have a net worth of a few million dollars. They live comfortably in their 90s with no financial worries. We are just now on the way back up, and I have spent the last several years beefing up our stocks, and this blog sure helps keep me focused to learn and not be afraid or ashamed to make the money. Yes – having money is much more fun than having no money! You are a genius!!! Hanging out with successful, motivated people is the best way to stay a successful, motivated person! I’m jealous you have MULTIPLE millionaire friends. Studies show you are destined to become a millionaire bc of the company you keep. I love that he drives cars from the early 2000’s! Sounds like a smart guy, please keep passing along the wisdom of millionaires! Yeah this series is going to be pretty cool, just gotta keep finding more millionaires to do the interviews with! That’s a good idea! I actually have the next one in mind, just have to get it set up! “Truth be told, money gives you freedom. Freedom to choose, do what you want to do, live with dignity at the end of your life. It gives you more options. ” — couldn’t agree more with this, even though I don’t have a million (yet) I’ve found more freedom/choices as my net worth has grown. This is a great article and love to learn from those who are already living the life you want in your future. Look forward to more of these types of posts in the future! Yeah that’s a great quote right? I think when you start thinking on money as a path to more choices it puts it in better perspective. I’ll keep cranking these out! Great insight, my favorite part of the entire interview was hearing that he drives cars from 2003 and 2000, I love that. Thanks for sharing these thoughts! Haha yeah that’s awesome! Definitely a good reason to keep driving those clunkers! So interesting! I actually know a couple (about 60 years old) who are multi-multi-multi-multi millionaires….you get my point, haha. And I find the way they talk about and use money FASCINATING. They’re insanely generous yet still practical and I’m constantly blown away trying to imagine what it feels like to have so much money. On the flip side, I know someone who is at the same level of wealth at SUCH a young age (about 25 years old) and their relationship with money is SO different. Both of them earned their own money but seem to have really different mentalities about it, spending it, etc. I’m sure age is a factor as far as perspective and attitude towards money. When you’re young, I’d imagine you feel like you can always make more! Most older people I know are trying to preserve their wealth for retirement or their family. I couldn’t agree more with Mike! Okay, keeping track of my account is not an issue as they are pretty consolidated but the stupid people comment is SPOT ON!!! Loved the interview and he is just spot on. Hehe his ego is going to be out of control the next time I see him!!! Yeah I’m not at the point where I lose track of my money…but knowing Mike and having a good idea of his accounts I could see how it happens. This is a great idea for a series! I always try to learn from people whether it’s from their successes or mistakes. I worked as a nanny for a Canadian family in Silicon Valley and I learned some interesting things from my boss about being your own boss. He bought rental properties in Canada in his mid twenties and immediately rented it out to college students (his properties are in a college town). He told me that he never made a mortgage payment in his properties with his own money. He’s owned them for almost 20 years, owes nothing on them and now turns a profit with rent. He also owns a hunting club. He makes deals with ranch owners all over California to lease out their property and sells memberships so members can book a hunting or fishing weekend. On top of that, he made is money in the first .Com boom in the 90’s. And he drove a 1993 Nissan Pathfinder ???? Hey that sounds like I guy I would get along with! Real estate is such an interesting wealth building vehicle. One of my goals is to have commercial real estate properties as soon as I build this business to a point where I feel comfortable dropping the money into it. I’d imagine I’ll buy one in my early to mid 30’s…but who knows! Absolutely! I’ll try to get more real-estate experts on the site this year so I can get more investing bases covered! I love how he answered you honestly! Even telling you what he thinks as he looks around at people being idiots. Did he know he was going to be on the blog ? Haha! Haha yeah since he’s been in the service industry his entire professional life I think he gets crap from customers that have a much lower net worth than him. That is the biggest takeaway – they are normal(ish) people! This is a really nice series! Just goes to show the power of owning your own business, right? The answers sound about right to me, except I was surprised that it sounds like he is heavily in equities and making a strong play in energy stocks. I’ve heard of other folks that once they get to that level, unless they are Wall Street types, they cash out and go heavy into municipal bonds and that type of thing to just preserve wealth. Hehe that’s a great point – he is not a fan of bonds or the asset allocation that a lot of stock expert/talking heads push. He is still an aggressive dividend investor, and there are plenty of energy stocks right now for example that pay a very competitive dividend! I don’t want to speak for him too much, but I will say that he is able to have a higher level of risk in the markets because he has absolutely zero debt. If the markets crashed and he lost 75% of his “house money”, he would still be able to retire better than most due to some real estate assets not mentioned in the post. Great article. Like anyone who has aspirations, you always want to look forward to see what makes the difference between where you are and where you want to be. A great idea for a series and I thoroughly enjoyed your post. There will always be questions for learning sake or just curiosity. One of the best parts of the post was when it was said that everyone has problems, just with different zeros. I thought it was interesting he had a specific number that he felt he would be happy with. I imagine that number is a moving target for most people. Thanks for the insight into the life of a millionaire. I noticed that too. $50 million. It kind of surprised me he would put such a definite price tag on it. I’d be curious to hear how a multi-millionaire with $50 million would answer that question, if the needle would move to 9 figures. Great series! Can’t wait for the next one. Yeah if you like buy and hold he is your guy! I think that may be where he has lost track of some of his accounts from time to time. There’s so many stock splits and account changes over the years, and he probably doesn’t have online accounts for everything like millennials do! It surprises me that he tries to remember where it (his money)all is. Why, doesn’t he have some kind of spreadsheet or app to track the whereabouts of his finances? It is so fascinating to me that 10 million is the magic number for him (without knowing anything about his obligations or desires). It just seems so big and hard to spend. Hey ZJ – it was actually 50 million! I think that’s the point – it would be so hard to spend that much that he would never have to worry about running out. Even at 4 million, a few health disasters and a stock market crash could make things a little dicey! Good interview. I reached the $1 million net worth by age 40, same as your friend Mike did, and plan to get to his level of net worth by his age (have 10-15 years left). I did it without starting any business, just being focused on succeeding and moving up in the corporate world all the while renting (never bought a home), moving around the world for better jobs, and driving only old cars wherever our family lived (never bought a new car in my life). The truth is, you don’t need to start a business (and face the long odds of it surviving) to reach a million or more in net worth. That’s awesome, congrats! That’s interesting that you never bought a home; it’s such a controversial topic in the PF world haha. I think the average Joe has a shot to be a millionaire IF they make the sacrifices of living below their means early and avoid the big purchases. Absolutely. You bet Average Joes can do it. Homeownership has many pitfalls, especially if you want to build a solid employment career. Two being a multiple of one, I technically qualify as a multimillionaire, although I don’t think of myself as such. You certainly wouldn’t know it by the way I live or the car I drive. If you’re interested in doing an e-mail interview, hit me up and I’d be happy to answer whatever questions you come up with. I enjoyed this interview. It surprised me that his ultimate number for happiness would be $50 million dollars! I liked that he was honest about does money make you happier. I think sometimes people get caught up on the idea of using the money to buy things and not the freedom and security that it can grant you. I love the part about him driving older cars. We are not rich but we are debt free and our mortgage is paid off. I wish he could give some advice on buying old cars. We have a 2001 Honda Civic we bought 4-1/2 years ago for about $3700. We have a 2001 Honda Civic that we replaced the transmission in twice, among other things. 🙁 We read later that Civics were bad that year. It’s funny you mention that – I was JUST thinking about making a guide for reliable used cars. I’ll add that to the posting list for next month! Great read, I love reading how people became or become millionaires and will definitely follow the interview series. Not to mention continuing to follow as many of the bloggers on the rockstar blog list to see how they did it. The truck was interesting. The Denali is a great vehicle, though pricey and definitely anti-mustachian, but he has 140,000 km on it and I’d wager he will keep going for quite a bit longer and it likely still looks great and drives comfortably. Maybe not always a bad choice. Sometimes, I think we all forget the power of compounding. If I can earn 12% per year on my money then I can double roughly every six years, which would give me almost four doubles before I’m his age = $24 million. Maybe at some point I will be more risk averse and not keep seeking double digit returns at the risk of my whole nest egg, who knows. I like his goal of $10 million and its close to mine ($7 million – $10 million), which would give me between $4 million and $7 million after taking home equity out. At that rate, with a 4% withdrawal, you’re looking at $160,000 – $280,000 per year. Him and I actually have the same truck (kinda…I have an even less mustachian Yukon XL) and love being able to tow our ski boats (super non-mustachian) wherever we want! I’m intending to write a post about how I feel a fraud as Happy Frugaler because I’m not very frugal. Do I want to be financially independent? Yes. Do I want to spend less? Yes. Do I want to be mustachian? No. The more I read, the more I recognize I’m closer to @genyfinanceguy than I am @MMM and would rather focus my writing and living in that direction while applying mustachian techniques where they make sense. I feel the same way at times, but you’re spot on about applying where it makes sense. MMM is not the end-all be-all when it comes to frugality. I much prefer an approach similar to the Frugalwoods. It’s all about making it work for your lifestyle and your happiness. This coming from someone who feels like I’m heading to the dark side for wanting to upgrade my car. Im going to check out your blog and would love to read that post. This post was a whole lot of fun and all I could think of as I was reading it is “yes, yes, yes!” Mike nailed all the important points IMHO. And I love the fact that his vehicles are older…typical Millionaire Next Door stuff…Unless they’re megamillionaires, millionaires (or folks who are relatively comfortable and well on their way) aren’t showy people. He sounds down to earth and like a pretty cool guy. Thanks for sharing this interview series with us. Fun stuff. Note: As for where “all the money is”, that’s something I FINALLY fixed for our family this year. The F2P household had 18 accounts with 6 different firms (I know!!!) and brought it down to the basic necessary accounts with 3 firms (In order of size: brokerage, business ch/sav and personal ch/sav). HUGE difference in our ability to manage our money (much easier to calculate NW) and significant savings in various fees. I highly recommend it. He basically is the embodiment of millionaire next door haha. I know for a fact he puts a pizza box underneath his truck at night when the oil leaks from it! I like this series! My father always bought used cars. He’d say to me, “I don’t see why I should go get a new, expensive car when my boss drives an old truck”. Then he would proceed to tell me how you can’t spot a millionaire because they might show up in slippers and old clothes. It’s the poor people that try to show off, ha! I chuckled while reading The Millionaire next door and now this. The mileage on his cars was my favorite part. Thanks for the insight and the smile. No problem Vonn! I’ve got a person with an extremely high net worth that I’m trying to track down for the series. Would be interesting to hear the perspective from someone that owns a private jet! As for judging someone’s net worth from their cars, clothes and jewellery – forget it. Some of the scruffiest people I know are the wealthiest, and rarely drive flashy cars. Money breeds more money, just as debt breeds more debt. It’s a mindset thing as everyone reading these types of blogs recognises. Break the debt cycle, and you start the money cycle rolling!! For the next interview ask what the top 3 biggest regrets they have and the same about right decisions they have made over the years. Would love to learn from their mistakes and their successes. I like that! I’ll try to add it in. I would also like to know “Mike’s” biggest regret or the one thing he’d like a do over on. My husband & I are newly minted millionaires took 27 years of investing in a 401k among other things. We married at 18 and have worked as a team (lucky for him I do not like to shop.) like I’ve always said to my three adult children if you WANT more then get out and DO more. Hey Johna! I’ll ask him and see if I can get him to respond to your question. I’m in my 40s with an 8 figure net worth. Left the workforce in my 30s, but didn’t know at the time that it would be for good. I thought I would just take a year or two off. I think multi-millionaires have extremely varied lifestyles. Some live in huge mansions, some like myself live in a small house. I actually felt no difference as my net worth passed each million mark until 5 million. I live in a very expensive part of the country and 5 million wouldn’t get you far here since a 2000 sq ft house would cost over 2 million, leaving just 3 million in investable assets. After 10 million, the feeling of security kicks in but I definitely still follow a budget and watch spending. I think your friend’s estimate of 50 million is pretty good for not ever worrying about spending (other than yacht or jet which would still be out of reach at that level). My biggest regret is following the standard advice of diversifying your assets. Diversification is for asset preservation, no one ever became wealthy from diversifying. Had I not diversified, I’d have about 150 million now (pre-tax). 1. What surprised me was that it sounds like Mike invests some of his money in individual stocks. Which individual stocks are so hard to predict you would think he would avoid those and stick with real estate or mutual funds. Then again when you are a multi millionaire like Mike I guess you can afford to do that. 2. What didn’t surprise me was that he said people waste money on the ever depreciating got to have it vehicles. What I thought was most interesting is what Mike drives. I think it’s actually pretty cool that he drives those high mileage vehicles. Sometimes people question you “all you have the money why aren’t you driving a brand new BMW”. Well you just answered your own question! I have money because not driving those types of vehicles. I’ve sacrificed driving older reliable not so new cars so I could invest tut car note into something that will make me money! I’ve seen Mike’s portfolio – he does have a mix of things and invested in mutual funds when he was younger but hates them because of the fees and underperformance. He has a very specific set of parameters that he looks at when he invests in individual equities (PE of around 10, low debt, etc.) but is probably better described as a dividend investor. He generates about $50-60k on dividends every year alone. He also has REIT’s that don’t do nearly as well as his individual picks. He’s the main reason I drive an old car, and his actually older than mine haha! Very interesting interview. It almost gave me a perspective as if I was a millionaire for just a second. I totally agree and my guilty myself for spending money at times with unnecessary items . So, I just happened upon this site. I loved the interview, even more I liked the responses that the interviewee gave. I’m 42 and have a networth between $10 – $20 MM. All self made and earned money with all of it in cash. Basically, I’m not counting any of my possessions (homes, cars, jewelry, etc) and I’m subtracting all of my debt. I made my money over 25 years, and I was a high income earner for at least 22 of those 25 years ($150k + a year in earned income not including bonuses or stock options). Why am I responding here? Because I found the answers to the questions to be in line with the answers I would give. I always thought I would be wealthy even though I grew up extremely poor. How did I do it? I worked extremely hard to put myself in positions that made me uncomfortable, I was honest with myself about my positives and my negatives, and I always betted on me even though I don’t gamble. It feels good to be wealthy and no I don’t worry about money. However, it feels good to be wealthy not because I have money, but because I always believed I would and I was right. Denzel Washington said, “The bridge between gcoals and achievements is perseverance and consistency”. I wholeheartedly agree. Here’s to all of your success! You have to believe it first and watch the rest of the world follow. Please enlighten us all what you did for a living to amass 10-20 million dollars in cash over a 20 year period. Long story short I worked my way onto the management team and into an equity position of a private equity backed startup. The company was built from the ground up and sold in 4 years for over $1.5 BB. The company was not in the IT or internet space. Also, I took deliberate actions to position myself for the opportunity. Explaining those deliberate actions would be the long story.